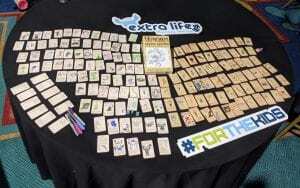 Extra Life United is an inspiring gathering of charitable gamers from across North America. While the tournament itself is produced with ample philanthropic entertainment, we love when attendees bring their own creative fundraising ideas into the fold; ensuring that every year is unique and full of surprises! 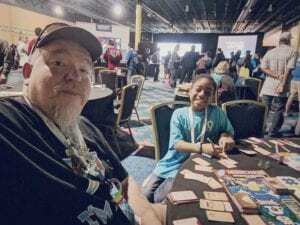 We were particularly impressed by Fragforce team member Dave Denison (also known by his online handle Immaginos), as he powerfully utilized a game of Munchkin to drive donations and support kids in need. 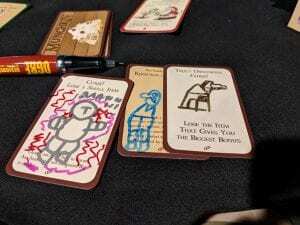 When he discovered the Munchkin Sketch Edition, a Steve Jackson Game retailing for only $19.95, he saw an opportunity to multiply the game’s power. Extra Life United brings 300+ tabletop and video gamers together to meet 19 Champion kids who have overcome seemingly insurmountable odds at a Children’s Miracle Network Hospital and are now thriving today. Dave invited the attending Champion kids to sketch on the blank cards and began to fill blank cards with tournament attendees’ drawings as well. Kids like Samerya, who has been receiving ongoing kidney treatment at Children’s National in Washington DC, sat down with Dave to both sketch and learn more about the game. After all the sketches were complete, it was time for an epic Munchkin battle. Salesforce provides employees with $500 grants which they can donate to their cause of choice. Salesforce employee and Extra Life United attendee, Ben Gray, committed to support the page of whoever won the game. Competitors fought hard to win the funds and the ultimate victor was Sarah Shirley who won $500 for Riley Children’s Health in Indianapolis. At the conclusion of the week’s tournament, Dave invited other Extra Life United attendees to bid to win the game, ultimately using the game to fundraise an additional $550 for DC’s kids who enter Children’s National. In total, Dave took a $20 game and used it to fundraise over $1,000 to help heal kids in both Indianapolis and Washington DC. For the highest bidder, Christian Garcia-Baker, the opportunity to take home this precious memento designed by Champion kids and to financially support such a remarkable cause proved to be money well spent!